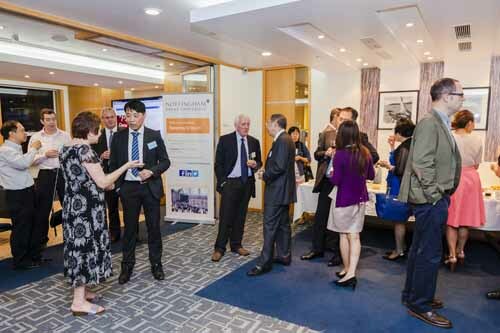 Professor Bob Rees (Director of the John van Geest Cancer Research Centre at Nottingham Trent University) and Dr Kevin Loh (a specialist in medical oncology at OnCare Hong Kong) gave a talk about developments in cancer research to alumni in Hong Kong. Alumni heard about the important developments in cancer research, specifically in breast and prostate cancers, and were able to ask Professor Reese and Dr Loh questions afterwards during the networking session that followed. Many thanks to alumnus Andrew Keith (BSc Hons Applied Biology 1987) for kindly providing the venue at Deacons, and to NTU Alumni Ambassador Chris Tang for his support in organising the event.